Haste is a unified force of 5 women who create fantastical worlds to portray the everyday. We are multilingual actors, clowns, dancers, creators, puppeteers, singers and friends. We are united with an urgency to celebrate the vulnerability and unpredictability of live performance. We use our patchwork of disciplines to reinvent old stories and create new ones. Our shows sit in the uncomfortable place between laughter and tears. Fusing comedy and tragedy, the ugly and the beautiful – we shock, stimulate and entertain. We create magic through simplicity and haunting harmonies. Our playfulness and energy is infectious. After a great run at Edinburgh with Where the Hell is Bernard? 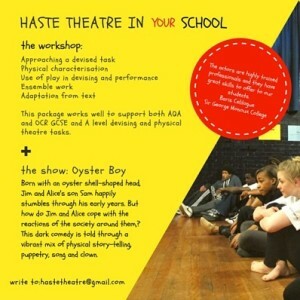 Haste is now back in London, working on an exciting project in a girls school in Didcot about identity and suffragettes. They will be touring the UK from February 2019.